A PROGRESSIVE levy will be implemented by 2019 in a bid to discourage the hiring of foreign workers, the home minister said. Ahmad Zahid Hamidi said employers preferred to hire foreigners if the levy remains too low. 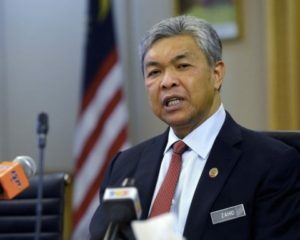 “The suggestion on progressive levy increment and the creation of a more conducive and competitive environment was made and agreed upon to increase the employment of locals,” said Zahid, who is also deputy prime minister, after chairing a cabinet committee meeting on foreign workers and illegal immigrants at Parliament today. The progressive levy rate will be based on the number of foreign workers will be implemented in 2019. Foreign workers would also be subjected to more health checks to stem the rise of infectious diseases in the country. Starting from 1st January, 2018, it is compulsory for foreign workers to undergo four health examinations – prior to their departure, within one month upon arrival in Malaysia and at the end of their first and second year, with additional follow up health examinations every two years. “The government has made it easier for the employment of foreign workers through the integrated foreign worker management system (ePPAx) and online application for employment of foreign workers (SPPA), which have been operating since April this year. The number of legal foreign workers decreased to 1.758 million as of July 31, compared with 2.135 million at the end of 2015. Eight issues were brought up in the committee meeting on improving the employment of foreign workers and the new levy rate by the Ministry of Human Resources. The Health Ministry suggested increasing medical checks while the Ministry of International Trade and Industry suggested the temporary placement of foreign workers in the manufacturing sector under the factory-in-factory concept. The Ministry of Domestic Trade, Co-operatives and Consumerism brought up the matter of self-service at petrol stations. The Home Ministry brought up the issue of the registration of enforcement cards (e-kad) for illegal foreign workers and employers, employment for Rohingya with UNHCR cards and the current status of the employment of foreign workers.